Fedora, the community version of the world famous RedHat GNU/Linux distribution has released their latest version 16.0, code named “Verne”. Starting with Fedora 15 Gnome Shell/3.0 has been the default desktop and this version brings and up-to-date Gnome Shell, KDE Plasma Workspaces 4.7 and some totally new software applications. For instance, according to their release notes page, a new application called “Ease” (a presentation creation app for the Gnome desktop) has been added, a new OCR software suite called “Cuneiform”, a navigation front-end that uses the OpenStreetMap project called Routino are some to mention. And interestingly the new size of the CD ISO image has been reduced to 605MB!. The last time I tried the Fedora’s official Xfce spin, bugger just told me that I should at least have like 760 (or something) MB of RAM! which is obviously a bug since the sole purpose of trying Xfce is to run it in an “old” PC with minimum of requirements. So hopefully this may have been fixed for Fedora Spins. *. 10 GB of space. But remember these are just the minimum requirements thus if you want the best performance then you’d have to have 1GB or more RAM with faster CPU and GPU. GRUB boot-loader version is 3.2.3, a secure boot technology called “Trusted boot”, Aeolus Conductor (a web based Cloud manager), Kernel 3.1.0 are among its other new features. If you want to give it a try, then go to this Fedora download page and choose your preferred desktop (Xfce, Lxde, KDE, Gnome, etc) and hit the download button!. 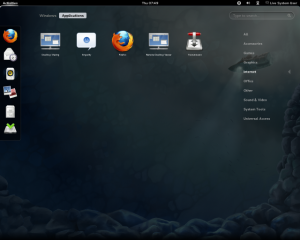 How to Install Firefox 8 in Ubuntu 10.10 and 10.04? How to Manually Restart Ubuntu Unity Desktop?